KUDOS TO the Noble Pig for getting rid of plastic straws. It is, you might say, a noble thing to do. 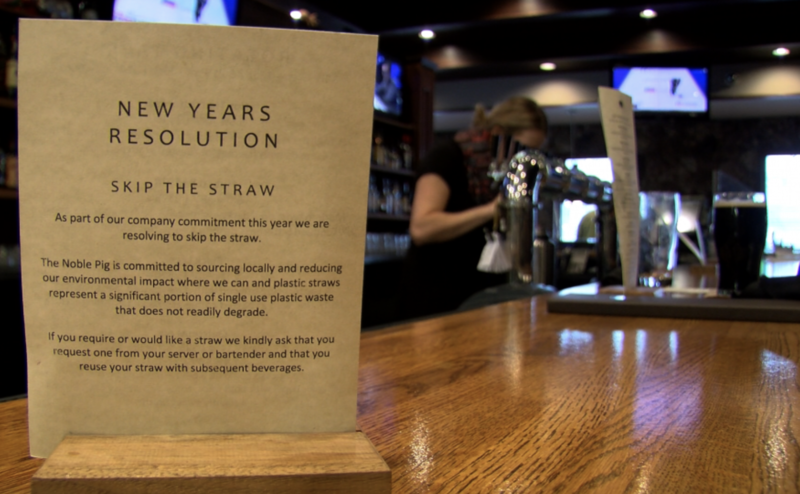 The popular local brewhouse and restaurant has decided to do away with straws in its drinks unless customers specifically ask for them, and to move toward bio-degradable straws for those who do. Environmentalist David Suzuki has long argued for getting rid of plastic straws. He points out that in the U.S. alone, 500 million of them are discarded every day, or more than 180 billion a year. That means 1.4 million kilograms of plastic is sent to landfills — and into our oceans — every day. Plastic straws have been around since the 1960s when they began replacing paper straws. Now they’re even used in plain old glasses of water in restaurants. The problem is, they don’t biodegrade. Anti-straw campaigns are springing up all over the world, and a lot of restaurants — the Noble Pig being the latest — have stopped using them. Straws, which are among the top 10 litter items found in beach cleanups, haven’t drawn as much attention as plastic shopping bags, but they’re getting there. And while we’re talking about plastic, it may be time for local governments to legislate against those bags. Yes, some local stores now charge for plastic bags, but I can tell you my own super market observations suggest it hasn’t made much difference. Let’s face it, plastic is big business. It’s durable and it’s cheap. Biodegradable straws, for example, cost five times as much as the plastic version. Hopefully, more restaurants will join the anti-straw movement and show the kind of environmental awareness that the Noble Pig has. But making a serious dent in the problem requires a partnership between customers and businesses. We can start getting serious about bringing re-usable shopping bags to the grocery store, and we can start telling restaurants not to put straws in our drinks. Eventually, it will make a difference. Mel Rothenburger’s Armchair Mayor editorials appear twice daily Mondays through Thursdays on CFJC- TV. His Armchair Mayor column is published Saturdays on ArmchairMayor.ca and CFJC Today. Contact him at mrothenburger@armchairmayor.ca. Yay for the Noble Pig! Thanks for this article, Mel. Kooodos to the Noble Pig for their stance on plastic straws.Now, lets work on other buisnesses to do the same.Lets ask (and eventually force) other buisness to stop putting plastic covers over their food plates.You can ask them not to put a plastic lid over your order.The worst offenders tell me “sorry , head office makes us do it ” But the customers can tell head office not to.But it takes effort.STOP USING PLASTIC WITH YOUR FOOD> Do not use plastic bags, forks ,knives etc . I believe that microscopic plastic particles may be the main cause of the diminishing numbers of salmon among other species in coastal and fresh waters.The future is bleak indeed if “WE” don’t stop destroying what we have.